The 90’s were pretty special. The Macarena, pagers, Supermarket Sweep, fanny packs, silly putty, Dunkaroos, Free Willy, slap bracelets, bubble tape, Gameboy, the Fresh Prince of Bel-Air…I could go on for days. 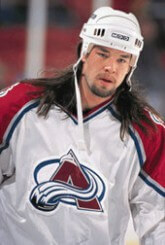 But for a special few – hockey players – the 90’s conjure up different memories. 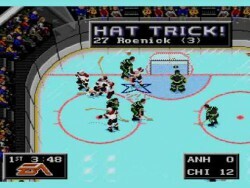 Although a far outcry from today’s NHL games on XBOX and Playstation, the old school NHL games on Sega Genesis were some of the most addictive video games ever made. And if you were an avid player you knew exactly which players you want performing specific moves to guarantee a goal, wreaking havoc on your newbie opponent’s morale. It pays to be a wily vet. Granted, the 1980’s Art Ross trophies were exclusively captured by Lemieux and Gretzky, but the 90’s welcomed Jagr to the esteemed list. 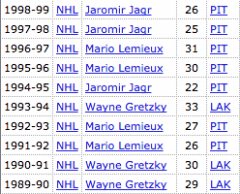 Gretzky and Jagr each captured 3 Art Ross trophies in the 90’s while Lemieux displayed supremacy by winning 4. “A” for effort? Or terrible idea to begin with? Although unfamiliar fans struggle to follow the puck, the neon glow and trails agonized the NHL’s dedicated fans. Fortunately, the glowing puck era was short-lived. It’s been tried numerous times before and after, often times in other sports, but no one pulled it off with the flare of Mess. 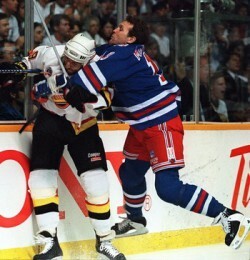 Down 3-2 in their series against the New Jersey Devils, Messier guaranteed a Rangers win prior to game 6. 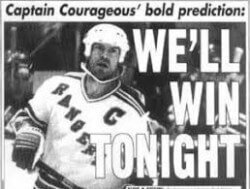 Not only did they win, but Captain Messier scored a natural hat trick in the 3rd period. Talk about badass. “Big E” was one of the most entertaining players of the 90s. Unfortunately, his willingness to rush the puck with his head down often resulted in devastating bodychecks to his head, ultimately shortening his career. 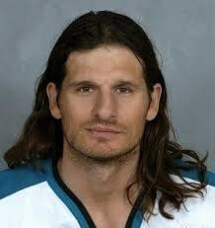 Specifically, Darius Kasparaitis and Scott Stevens’ hits were career-altering. 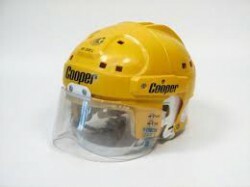 The Jofa bucket and Koho pads say it all. Beauty. Compact stance, Vic blocker and that mask…what the hell is going on with that mask? Classic. 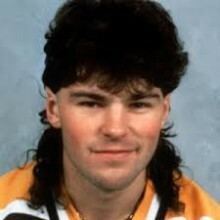 Rumor has it, Scott Mellanby executed a locker room rat with his stick prior to a game. Somehow, this became a symbol of good luck to the Florida Panthers fans who showered the ice with plastic rats after their team scored during their unlikely run to the 1996 Stanley Cup finals. 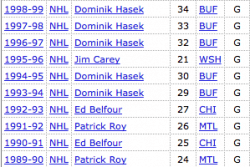 Talk about starting the 1996-1997 NHL season with a bang! The World Cup of Hockey brought together the best players in the world to defend their home country’s honor in August, prior to NHL training camps. Team Canada won the first of the best-of-3 series before Team USA won two straight to capture the World Cup title. Setting a record that might just stand the test of time, Teemu Selanne immediately became an NHL legend on his way to scoring 76 goals in his first NHL campaign. He set the tone for a HOF career ultimately accumulating 684 NHL goals and becoming the Olympics all-time leading scorer. 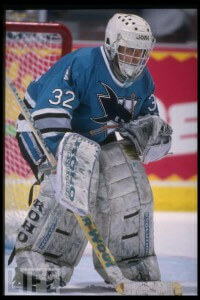 The 1992 NHL strike, the first in the league’s history, postponed 30 games of the 91-92 season. 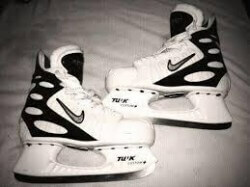 The 1994 lockout reduced the 94-95 season to just 48 games per team with no inter-conference games. 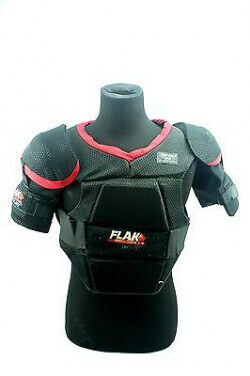 Some suspect the latter lockout combined with the clutch-and-grab playing style of the 90’s had negative long-term effects on the league’s fanbase. While Gretzky was rumored to go through 700+ wood Titan sticks per season in the 80’s, he forever changed the trajectory of stick manufacturing when he signed with Easton Hockey to use their HXP 5100 aluminum shaft. As quickly as aluminum became the norm, composite shafts and blades took the hockey world by storm. 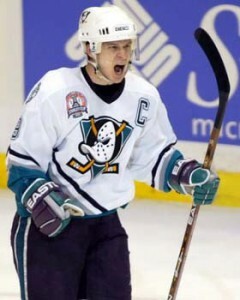 By 1995 Paul Kariya was scoring 50 goals with the first composite blade. 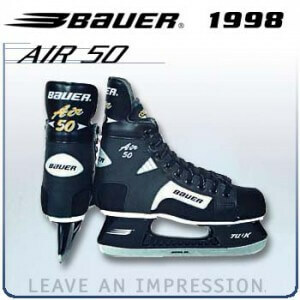 In 2001, Easton introduced their one-piece composite, the Synergy, and the rest is history. 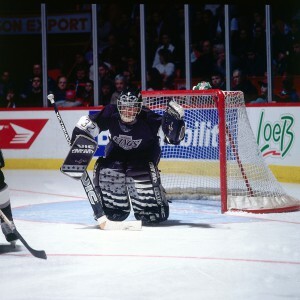 Aside from one sensational season from Jim Carey, the 1990’s Vezina trophies were controlled by Dominik Hasek, Patrick Roy, and Eddie Belfour. Of course, there are a number of noteworthy goaltenders of the era, but none with the consistency and supremacy these three showcased throughout the decade.